Charles-François Gounod’s Faust premiered at the Théâtre Lyrique on the Boulevard du Temple in Paris on 19 March 1859. It underwent several revisions over the following decade, including the insertion of a ballet into Act V to meet the expectations of grand opera, and was extremely popular in the nineteenth century. It was the work with which New York’s Metropolitan Opera opened for the first time on 22 October 1883, while Covent Garden included it in its programme every year until 1912. Today it may not be performed with quite the same frequency, but it has retained enough appeal to ensure that it graces most major opera houses at least once every few years. Goethe wrote Faust, on which the opera is based, in two parts, but when Gounod interpreted it he focused on only the first of these. This is because it contains the more dramatic subject matter, and the same approach was adopted by Hector Berlioz in his slightly earlier ‘légende dramatique’, La damnation de Faust (1846). However, Mefistofele (1868) by Arrigo Boito, better known today as Verdi’s librettist for Otello and Falstaff, covers both as it includes his encounter with Helen of Troy that constitutes one of Faust’s adventures in the ‘macrocosmos’, while Mahler’s Symphony No. 8 in E flat major (1910) uses the words of Part II’s final scene. At around three and a half hours, Faust is on the long side for modern day audiences, who consequently require something more than just a straight telling of the story to hold their attention. 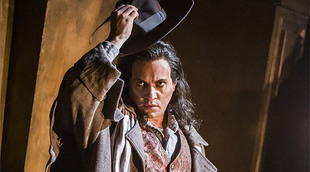 In the opera’s last appearance for English National Opera, Des McAnuff’s ‘solution’ was to site Faust’s study beneath an A-bomb, hinting at the doctor’s destructive thirst for knowledge that is so prevalent in Christopher Marlowe’s ‘original’ telling of the tale. David McVicar’s 2004 version, now enjoying its fifth revival at the Royal Opera House, keeps the concept much closer to Gounod’s original, with Faust’s search being (in origin, at least) for youth, with Marguerite acting either as the catalyst or the bait. Charles Edwards’ set consists of a dilapidated, half gilded theatre on one side of the stage, and the arches of a Gothic vaulted church on the other. In this way, the dichotomy between temptation and virtue becomes clear, with these points of reference standing as constants as various scenes are created by planting theatre curtains, Marguerite’s humble dwelling or prison-like bars between the two. Within this strong overarching concept, there is also an exquisite attention to detail. For example, when in Act II Méphistophélès supplies the crowd with wine, he pierces the side of a statue of the crucified Christ in order to obtain it. At the end of Act III Méphistophélès is instrumental in helping Faust to join Marguerite by installing the stairs that enable him to climb to her. Then as Marguerite prays for salvation in Act IV, Faust himself plays the organ in the church. 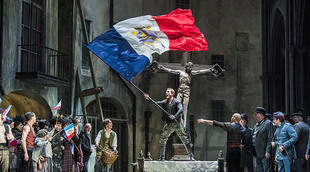 Alongside this, there is much flamboyance in Act II’s flag waving scene, which features acrobatics, and the subsequent dancing in ‘Cabaret L’Enfer’, courtesy of Michael Keegan-Dolan. Nevertheless, Act V’s Walpurgisnacht ballet is ultimately very poignant as it vividly describes the shaming of Marguerite and the fate of her brother Valentin. If the production is strong, this revival by Bruno Ravella also boasts excellent musical credentials. Conductor Dan Ettinger relishes the score, while also achieving a fine balance across the orchestra as a whole, and the chorus is in good form, especially in the men’s ‘Gloire immortelle de nos aïeux’. As Faust, Michael Fabiano has a great ablity to vary his sound so that in solos such as ‘Salut, demeure chaste et pure’ he can be very much the light, romantic tenor, before applying more heft to his voice to meet the malevolent Méphistophélès in their conversations. On opening night Mandy Fredrich only stepped in to replace an ailing Irina Lungu as Marguerite at the eleventh hour. She is, however, experienced in the role, and the fullness of her sound did not prevent it from feeling sensitive because the clarity, shape and attention to phrasing were so strong. The highest accolades, however, go to Erwin Schrott who, with his magnificent bass-baritone, steals the show as Méphistophélès. His presence is also formidable as he appears totally at ease as he rises from hell at the start, merely wafting the accompanying smoke away with a handkerchief. However, we see the seriousness and severity cut in at those moments when he wishes to ensure that things move in exactly the direction he wishes, while his faltering at the end as he comes face to face with an angel is equally effective because it is not overdone. 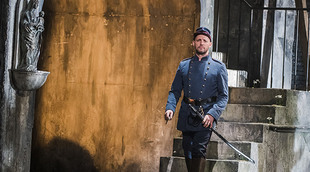 There is also excellent support from Stéphane Degout as Valentin, Marta Fontanals-Simmons as Siébel, Carole Wilson as Marthe Schwertlein and Germán E Alcántara as Wagner. This production will be broadcast live to selected cinemas around the world on 30 April, with some venues also showing encore screenings on subsequent days.